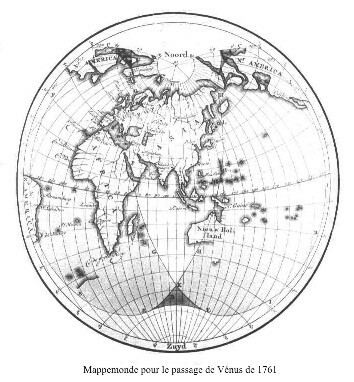 The map above from the book of H. Woolf "Transits of Venus" and often wrongly entitled "Map of the World for the Transit of 1761", is not the one that was disseminated by Delisle (this error was pointed out by Brian Grieg). The mappemonde sent out by by Delisle was drafted in French and contained two hemispheres, as did his mappemonde of 1753 prepared for the transit of Mercury of 1753. 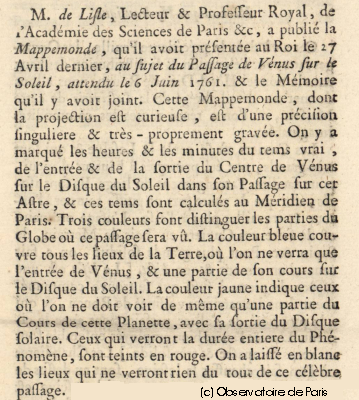 The mappemonde of Delisle was in colour, as shown in the excerpt of the report read to the French Academy of Sciences in 1760: "La Description et l'usage de la mappemonde dressé pour le passage de Vé sur le disque du Soleil qui est attendu le 6 juin 1761" (Copyright Paris Observatory). 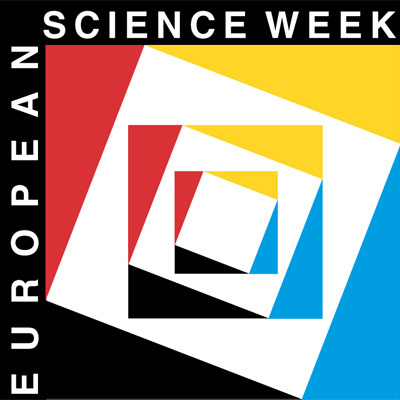 English astronomers organized two observing campaigns at remote locations. Nevil Maskelyne (1732-1811) went to theisland of St. Helena where he was unable to observe the transit because of bad weather. A second team, composed of Charles Mason (1728-1786), James Bradley (1693-1762) and Jeremiah Dixon (1733-1779) was supposed to observe from Bencoolen in Sumatra. In fact, they observed the transit near Capetown since Bencoolen had been taken by the French! John Winthrop, a Harvard professor, went to St John (Newfoundland) where " entouré de milliards d'insectes décidés à saboter sa besogne " ( Note 1), he succeeded in observing the last contact of the transit. The results were rather disappointing as the values for the solar parallax varied from 8.5" to 10.5", according to who reduced the observations. The great margin of error was due to two principal causes; poor knowledge of the longitudes of the observing sites and the phenomenon known as the black drop which affected the estimation of the instants of the first and the last interior contact. Two phenomena related to diffraction: the Mercury volcano and the black drop. During early observations of the transit of Mercury across the Sun, a bright point was seen in the centre of the black disc of the planet. This shining point was interpreted as an erupting volcano by some and as an optical illusion by others. It actually is due to diffraction for which the theory is completely understood and the phenomenon can be reproduced in the laboratory. The effect appears when the instrumental aperture is reduced and it disappears when full aperture is used. The phenomenon known as the black drop, which affected observations of the interior contacts of Venus' transits can also be seen in the case of Mercury's transits. It is due to diffraction and can be reproduced and photographed in the laboratory. " When the planet encroaches the disk of the Sun, diffraction smears two brilliant points which close again behind it, and which actually are quite distorted. When they are about to meet, Mercury seems attached to the solar limb by a kind of stalk, like a drop which is separating from a narrow opening... To observe this phenomenon, it is necessary to employ a magnification much higher than the optimum magnification calculated for the free aperture of the refractor. For example, for an aperture of ten centimetres, a magnification of at least 150 times is needed. Like the alleged volcano on Mercury, the black drop can be easily reproduced in the laboratory and can be photographed. " (A. Couderc and A.Danjon, 1969). You can reproduce this phenomenon by holding your thumb and index finger about ten centimetres from your eyes and in front of an intense source of light (the sky, for example). A phenomenon related to refraction in the atmosphere of Venus. 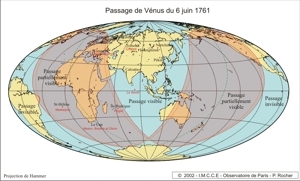 Observation of the 1761 transit led to the suspicion that Venus had an atmosphere. This arose from the sight of a diffuse halo around the planet which was observed between exterior and interior contacts. The appearance of the halo changes according to the position of the planet between the exterior contact and the interior contact. If the proportion p of Venus' diameter outside the solar disk is noted, the halo is often described as total in the vicinity of p= 0.5; sometimes it appears to be split with variations of light intensity in the vicinity of the direction of the planet's poles. It can also appear like a small luminous pyramid (Rittenhouse's observation at the 1769 transit). These different aspects will be noted also when the forthcoming transits are observed and will be explained by the presence of an atmosphere. Note 1: "surrounded by billions of insects determined to sabotage his work"